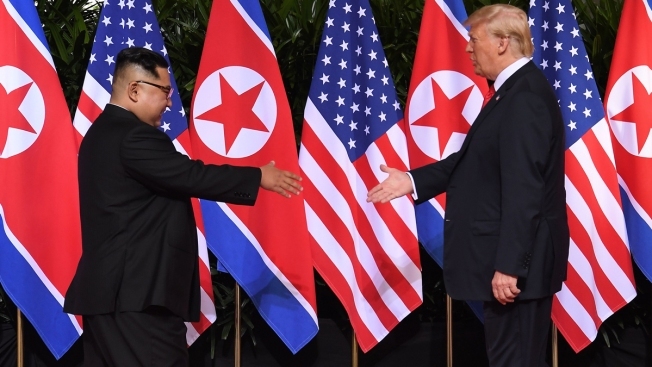 In this June 12, 2018, file photo, North Korea's leader Kim Jong Un (left) shakes hands with U.S. President Donald Trump at the start of their historic U.S.-North Korea summit at the Capella Hotel on Sentosa island in Singapore. President Donald Trump may be complimenting Kim Jong Un, but evidence shows that North Korea continues to make nuclear weapons — and the U.S. administration is taking a more aggressive stance in response, NBC News reported. 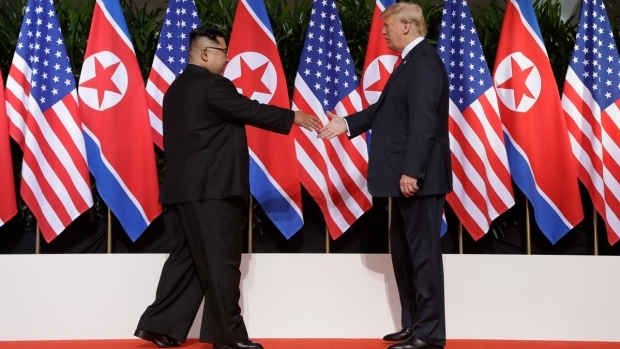 Intelligence shows that North Korea is working to obscure at least one nuclear warhead storage facility, according to three senior U.S. officials, despite the country's rhetoric about denuclearization. "Since the beginning of 2018, Kim has surrendered and dismantled no nuclear weapons, but has likely built five to nine new nuclear weapons. So he has not frozen his nuclear program and he has certainly not been denuclearizing; instead, he has been nuclearizing," senior RAND Corporation international and defense researcher Bruce W. Bennett said. While Trump thanked Kim's "commitment to denuclearization" this weekend, his administration is continuing its "maximum pressure" campaign intended to force Kim to denuclearize.